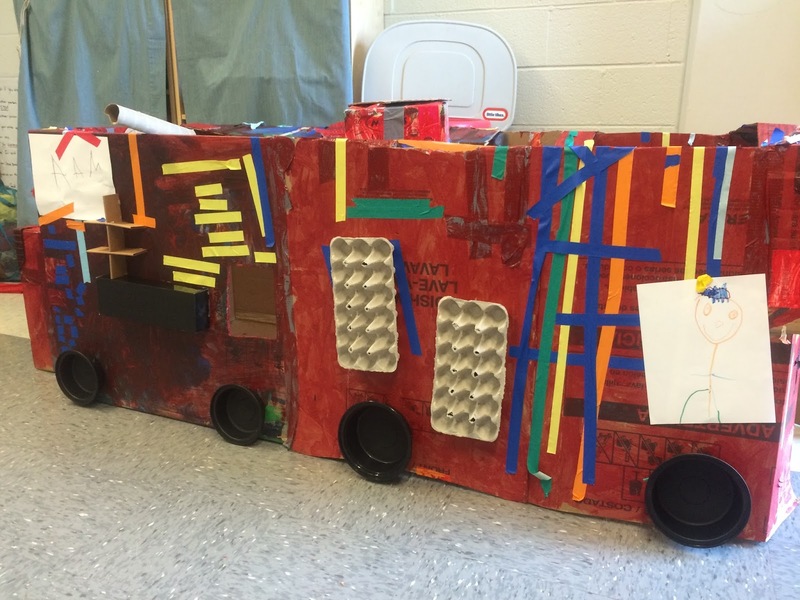 Tuesday SOL: What if we built a firetruck? Each of the early childhood classrooms is doing an author's study on Donald Crews. He has written and illustrated many great books about vehicles - Trucks, School Bus, Freight Train...just to name a few. 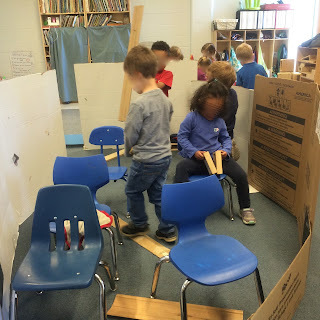 The teachers decided that it would also be fun if each classroom tried to create a vehicle of some sort - knowing how much preschoolers love cars, trucks, and things that go. What vehicle should we build? Well, in the Big Cats, this question had an obvious answer. 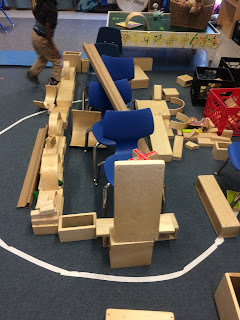 Pretty much every day, for several weeks now, the children line up the chairs on the carpet to create a firetruck. Our long cardboard ramps have been turned into firefighter hoses. 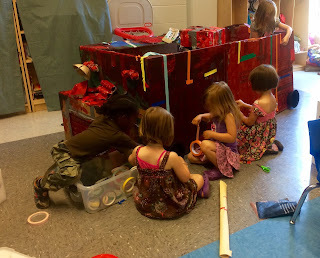 Typically, the big concern is a possible fire in the dramatic play restaurant. Firefighters are right there at the ready! 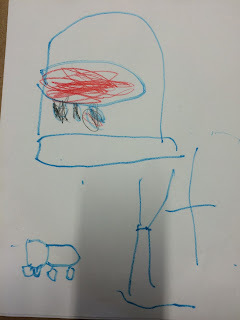 At the writing center, the children love to draw firetrucks. Yes, let's build a firetruck. A week ago, we began to build. I turned our old cardboard castle (originally, a dishwasher box) on its side and attached two tri-fold boards for length. 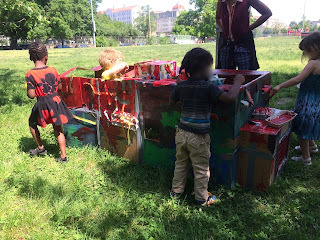 The children agreed - this looked like a firetruck! It was just the right size for children to get into and have some fun. 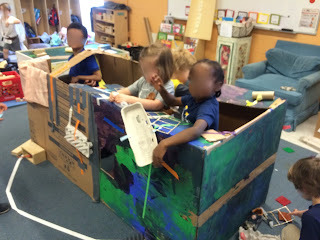 The children added all sorts of extra components - pretty much any cardboard scrap that we had in our recyclables bin was turned into something novel for the truck. This is what delight and focus looks like! 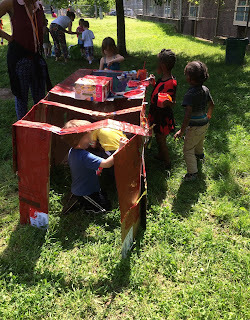 Of course, a beautiful day called for painting the firetruck outside. Bright red, of course. The children put a lot of taped stripes on the firetruck, simply because making the stripes was so much fun. 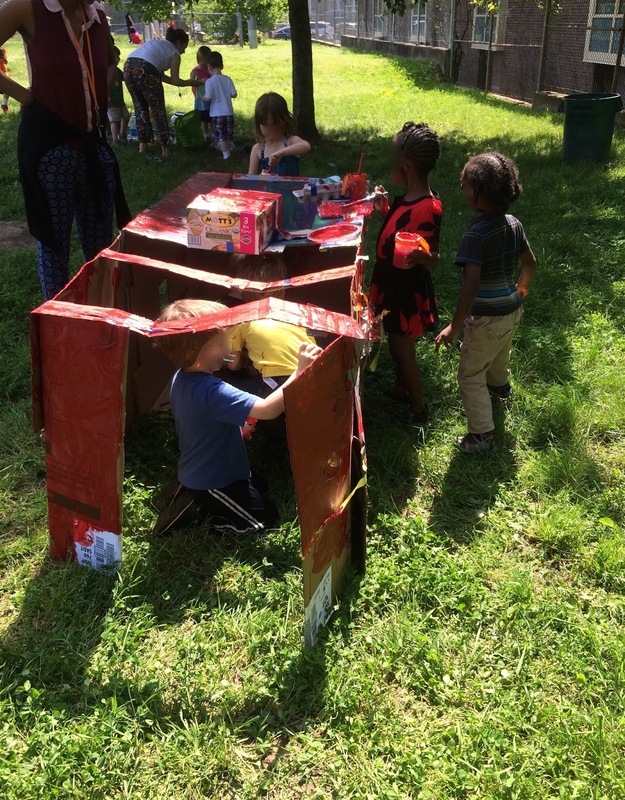 Cutting tape is the purest of pleasures for the preschool crowd. Oh, and we should probably draw a firefighter for the firetruck. Tuesday SOL: What do you learn at conferences? His parents and teachers sit down at the table while he surveys the empty classroom with a smile. This is different, his eyes seems to say. "Where is everybody?" he asks. Family conferences are such a treat for me - watching the children interact with their families, seeing the children one at a time, and no need to juggle conversations with several peers simultaneously. 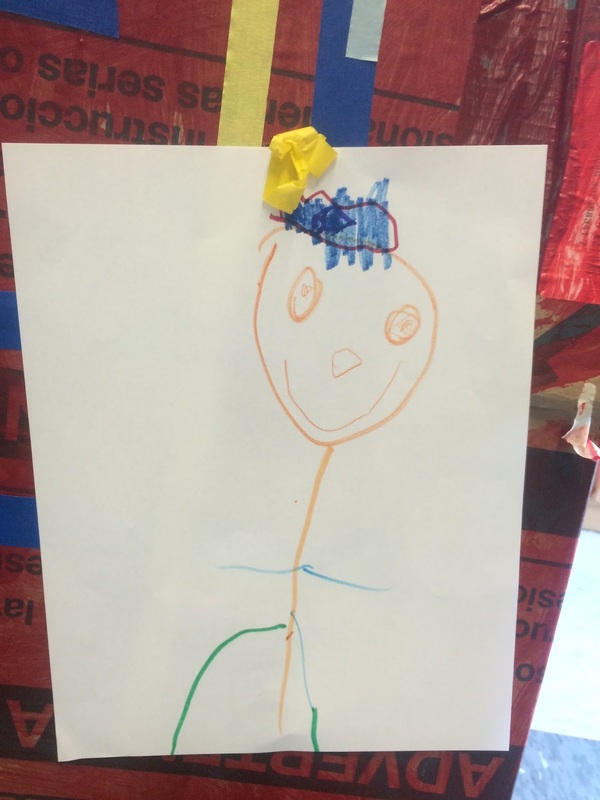 "This is your family conference," I explain, "we're going to meet with you, to talk about your successes this year in preschool, to share with your parents what you have learned." "Okay!" he says, excitedly, and then he pulls a chair up and sits down between the teachers, with a big smile. That one movement - pulling a chair not to the side of the table where his parents were sitting, but to a new position between his teachers - fills me with smiles every time I think of it. This is a child who is at peace at school. He loves school, he loves his teachers, he loves learning, he loves sharing with his family all his joys. 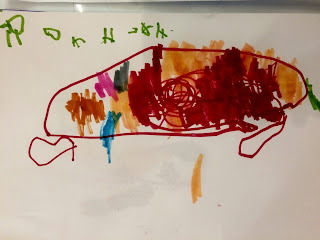 He shared "I am getting really good at writing. I am going to get better." "I am super fast at counting! I beat my Daddy at clean up." His father shared that they have timed games at home for finding things, for cleaning up, etc. 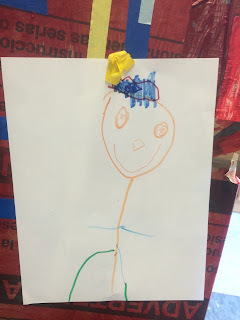 We talked about what a good friend he is, how he will speak up to his classmates when he doesn't like something - "I don't want to play that" or "I don't like it when you yell at me." So beautiful. So precious. So mature. Tuesday SOL What to write, how to write, why am I writing? I have been wrestling with writing each and every day. I am in the midst of a social justice writing class, where we have the seemingly simple goal of writing one article. How hard can this be, having blogged for several years now? Well, it has been so so so hard. My writing reminds me of folding a paper fan, where every fold represents a new draft; and yes - every draft is virtually the same as the one just before it. just beyond my writing grasp. It is a nightmare, as if each time I make a fold in my paper fan, the paper that I am folding grows and grows, on and on and on, without end. That's why you haven't heard from me in a few weeks.